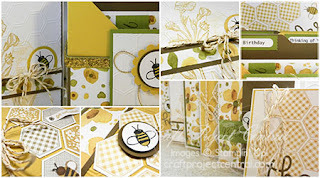 Just Julie B's Stampin' Space: English Garden Box & Cards! English Garden Box & Cards! Need a fantastic, useful, and attractive gift for someone special? You will enjoy making this project, and the recipient will cherish it! Create six pockets to hold an assortment of cards, a box to hold the pockets, and this tutorial also includes instructions for six assorted—coordinating—greeting cards to start filling the pockets. Once you give this box of cards to a special someone, don’t forget to replenish the cards throughout the year on holidays, special occasions, or just because. This ensemble would be great for a stamp camp. This sweet project was made by Regina Andari, and you can get her tutorial when you subscribe to the month of December over at Craft Project Central. Number of Years Anniversary Card! Baby's First Year Mini Scrapbook & Card! Sewn Box & Cards Gift Set! Water Colored Masculine Gift Card Set! Go Wild & Pamper Yourself! Creation Station December Blog Hop! Winter Holiday Punch Art Tag Set! 2016 Calendar / Keepsake Gift Book Set!